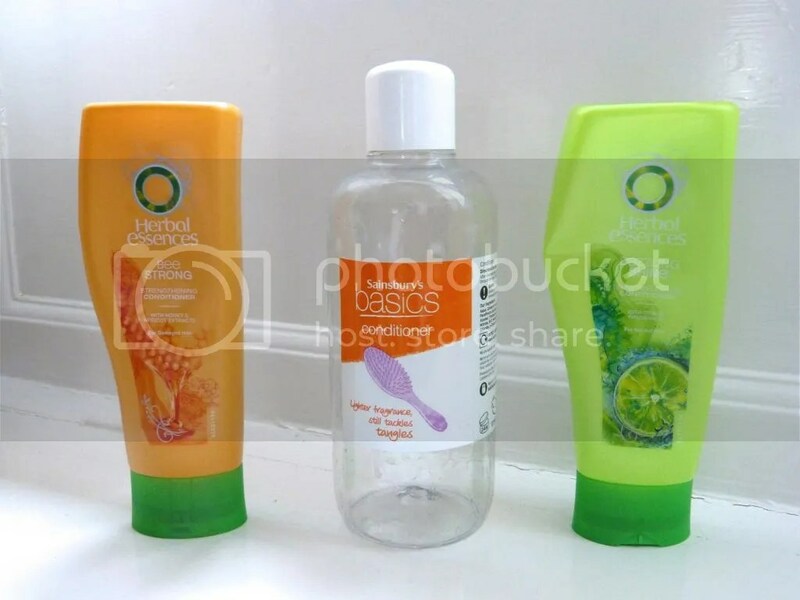 Haircare to start, and there’s a bottle of the usual, Herbal Essences Bee Strong conditioner, which you know that I love (review here), but I also went through a fair amount of other conditioner too! 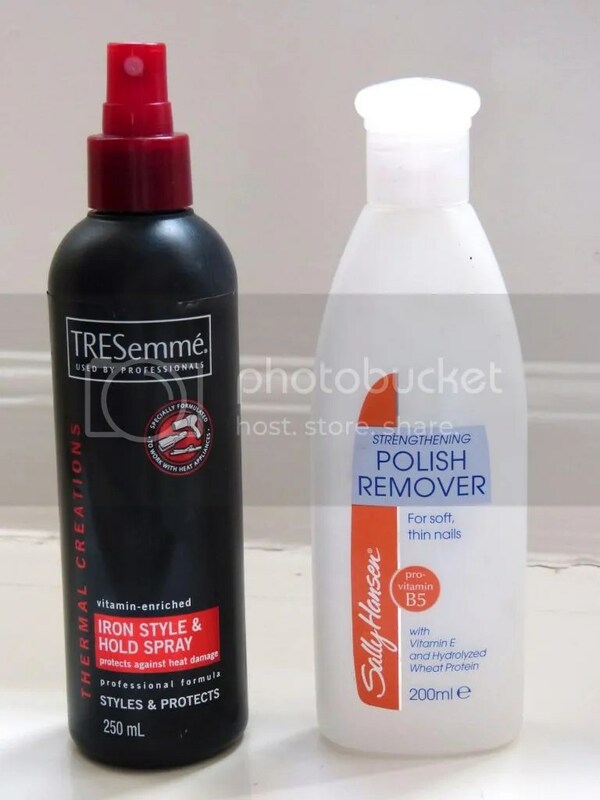 I like the Sainsbury’s Basics Conditioner for finishing off left over shampoo – it’s cheap and it does the job. There are no frills, but I like the plain clean smell, and when you go through as much conditioner as I do, the litre bottle is quite handy. I also changed things up a little and went for Herbal Essences Dazzling Shine conditioner, which is nice but not as weighty as the Bee Strong. I absolutely loved this Treacle Moon Warm Cinnamon Nights shower gel – I won’t gush too much as I’ve already reviewed this, but if you like cinnamon scents, you definitely want to search this out. I also really enjoyed The Body Shop Shea Body Whip*, which was the dark horse of my Oxmeet goody bag, given that I don’t normally like body lotion or shea scented things… This is so lovely though. It’s a great consistency, and the smell is fantastic, really warm and clean smelling. My one complaint about the pump bottle though was that it was impossible to get the last bits out! Body butter time! 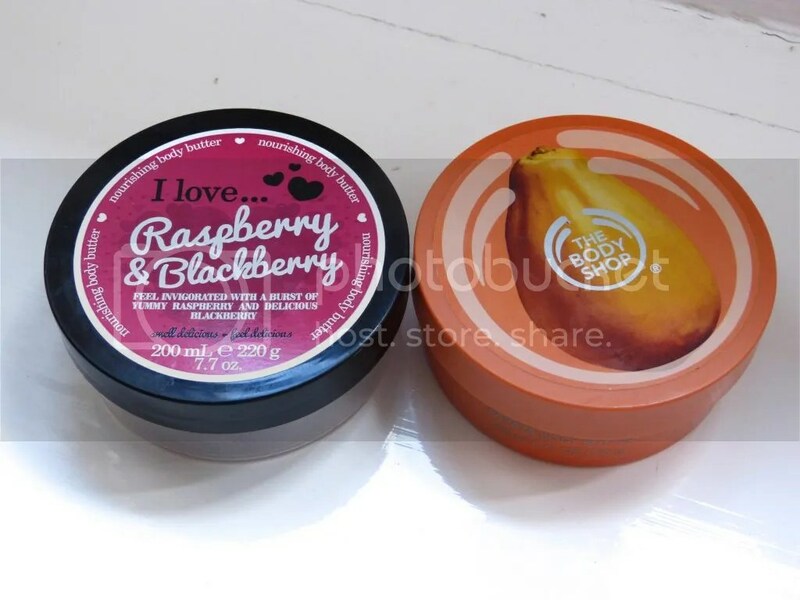 I’ve reviewed both the I Love Raspberry and Blackberry body butter before (here) and you know that I love all Body Shop butters, The Body Shop Papaya body butter being no exception. So these are both great, and I’d happily repurchase either! I love love love Soap and Glory Flake Away – it’s one of the few body scrubs that I find to be scrubby enough, without being salt-based. The smell is amazing, and it really makes my skin softer! The Body Shop Dragonfruit Lip Butter was gorgeous, really moisturising and with a lovely fruity smell, but I did find it was a bit thick and left a white tint on my lips. I mostly used this at bedtime! I was also impressed with the Crabtree and Evelyn Iris Hand Therapy Cream* – this was another Oxmeet gift, and I found it to be a lovely consistency, nice and thick and non-greasy. The smell was occasionally a little overpowering, but otherwise a nice floral. A rare perfume use-up – Lush Gorilla Perfume Imogen Rose solid perfume. This was gorgeous, a very sweet baby-powder rose, and the solid format made this easy to chuck in a handbag for top ups on the go (hence all the damage to the label!). Many people will hate this, as it’s very sweet, but I liked it a lot. I’ll be looking to replace this Ted Baker body spray as soon as possible – what a gorgeous scent! This was a Christmas present, and I’ve been eking it out for a while, trying not to finish it. It’s a little bit red berries, a little bit vanilla, and very lovely. Samples! Stop the presses, I’ve fallen in love with Nivea In-Shower Body Moisturiser. I really wasn’t expecting to, since i like traditional moisturiser, and don’t like feeling greasy, but this is just… magic! It makes my skin so soft, without that greasy layer I was expecting. I’ll probably pick up a full size of this for mornings when I don’t have time for the full body butter regime! 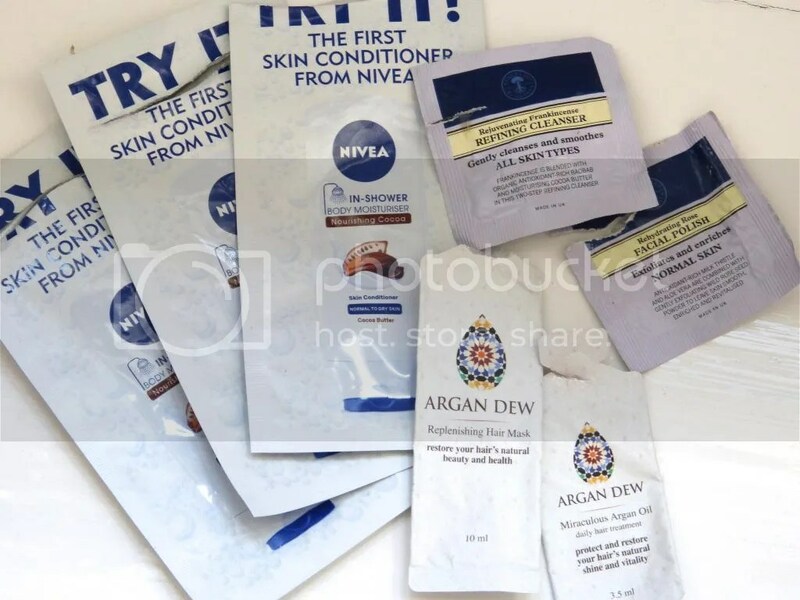 There’s also a couple more Argan Dew* sachets here – the oil in particular is very lovely for summer frizz. Check out my original review for more details! I’ve also got a few more bits from Neal’s Yard, the Rejuvenating Frankincense Refining Cleanser, which was a lovely consistency, but a smell I can’t get on with, and the Rehydrating Rose Facial Polish, which was very luxuriously thick, but not quite scrubby enough for me. 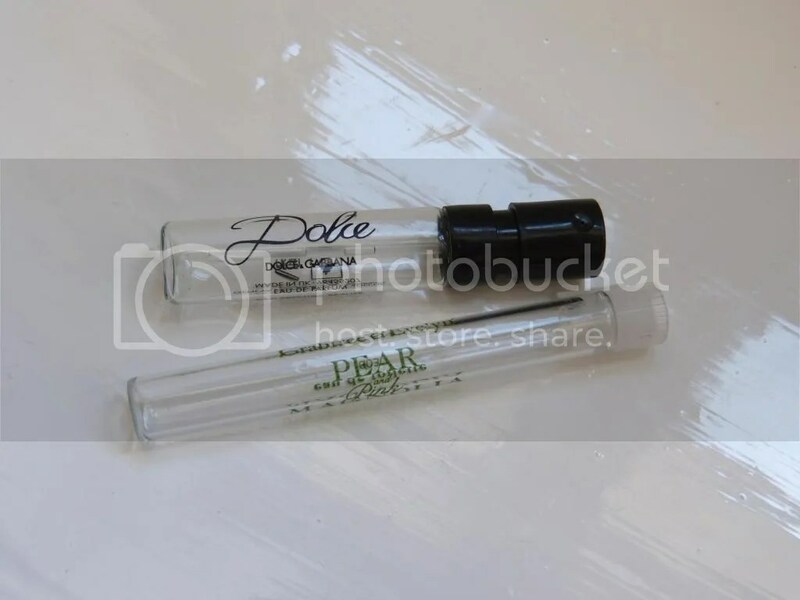 And to finish up, two little perfume samples. I didn’t think Dolce by Dolce and Gabbana was anything special, but I loved Crabtree and Evelyn’s Pear and Pink Magnolia perfume, and would definitely consider picking it up in future. I loved the fresh springlike fragrance. 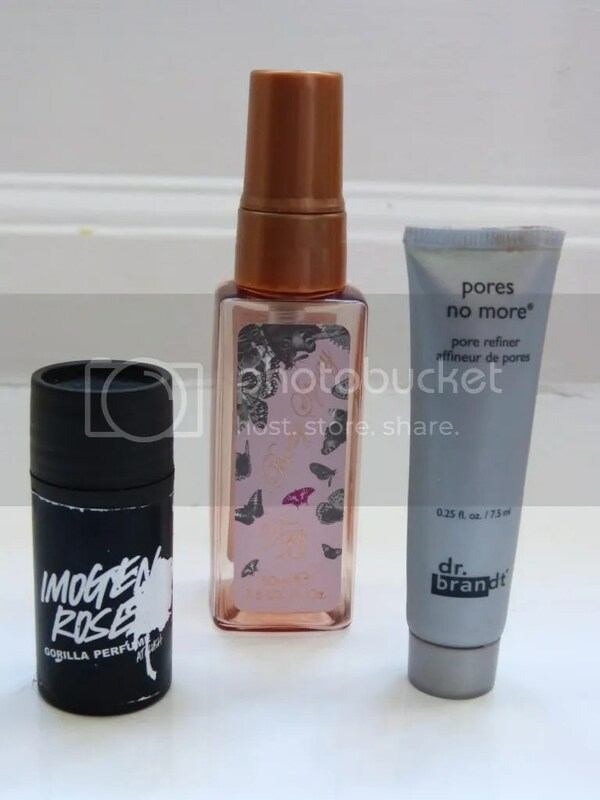 And that’s it for this month’s empties – show me yours! 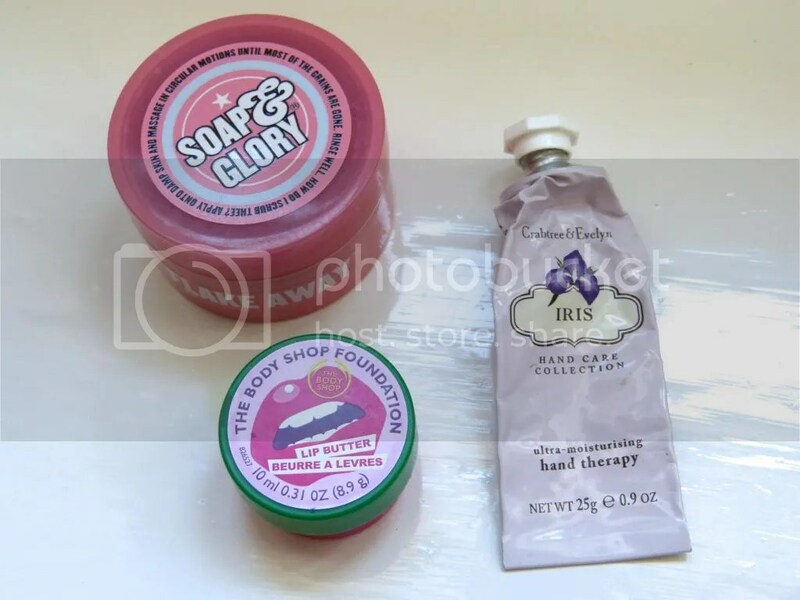 This entry was posted in Beauty and tagged body butter, crabtree and evelyn, empties, haircare, herbal essences, june empties, moisturiser, skincare, soap and glory, the body shop, use ups. Bookmark the permalink.